Certified Nurse Assistants provide the lion’s share of the direct care in nursing homes. They provide resident care under the direction of registered nurses and licensed practical nurses. They assist residents with the activities of daily living, which includes toileting, bathing, dressing, and lifting patients in or out of the bed. They provide emotional support for residents, observe them for any adverse reactions to treatment, and report concerns to nurses and physicians. CNAs account for approximately 65 percent of the workforce in nursing homes, hospices, residential care communities, and home health care agencies. 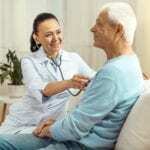 They may also work in hospitals, although it is to a lesser degree than in facilities that provide long-term care services. CNA training provides one of the fastest routes to entry into the health care industry. You do not need to have a high school diploma to practice as a nursing assistant, so the field is wide open to anyone who wants to care for others in a professional capacity. 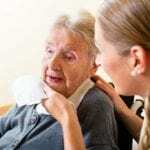 CNA programs in Colorado must deliver a minimum of 75 hours of instruction in the classroom and supervised clinical experiences in a long-term care facility. The competency evaluation, administered at the conclusion of the course, will determine students’ eligibility for certification to practice as Certified Nursing Assistant. A CNA’s role and responsibilities can be challenging and risky. The workload is demanding and involves heavy lifting, long hours of their feet, bending, and constant movement. Beyond the manual labor, nurse aides are also at risk of catching infections and may be the target of violence from residents. The mandatory training will help adults prepare for the role and demonstrate ways in which injuries, infections, acts of violence and other risks may be reduced. Due to the long-term care needs of senior residents, nursing assistants must be flexible and available to work evenings, weekends, and holidays. The Nurse Aide program at Western Colorado AHEC prepare students for cusses on the State Certification Exam. The curriculum covers a total of 104 hours of instruction: 80 hours in the classroom and 24 hours of clinical experiences. The course content covers anatomy and physiology, role and responsibility, medical terminology, measuring vital signs, observation and reporting, safety and emergency procedures, patient hygiene, nutrition and feeding, infection control, and hospice care. The program is delivered on an evening-only basis. Classes meet Monday through Thursday from 5:00 pm to 9:00 pm. Day-time classes are scheduled as needed. WCAHEC and the State Board of Nursing require full attendance to classes and clinical sessions. Students must notify the instructor in case of an emergency and make up for the missed class. Absences or tardiness exceeding 8 hours (cumulative) will be considered grounds for dismissal. Students must achieve 70% or more on the course quizzes to graduate from the program. The clinical experience will commence on the final three days of the class. The clinical schedule is 6:00 am to 3:00 pm. The tuition of $990 includes the non-refundable application fee, cost of background screening, books, malpractice insurance, and the certification exam fee. Scholarships may be available through the Workforce Center. Western Colorado Community College prepares adults for a career as a nursing assistant in home health care, hospitals, long-term care facilities, and hospice facilities. The duration of the program is 5 weeks, and students earn 5 credits. Classes meet Monday through Thursday from 5:00 pm to 9:00 pm. Clinical sessions take place during the last five days of classes. Course topics include individual rights of patients, basic nursing skills, personal care skills, restorative services, legal and ethical principles, emotional, social, and cultural needs, emergency, and nutrition and feeding. Practical experiences in the lab and supervised clinical practice in a long-term care facility will reinforce the concepts learned in the classroom. At the conclusion of the program, students will be able to demonstrate the skills outlined by the State Board of Nursing, have the characteristics of professional caregivers, and demonstrate the ethical standards that govern the profession. The total cost of attendance is $1,878. It includes tuition, supplies and uniforms, background check, professional liability insurance, and the cost of the nurse aide certification exam.